1. ResearchGate. A social networking site for scientists and researchers to share papers, ask and answer questions, and find collaborators. Educators can stay up-to-date with the very latest research or post requests for research findings on specific topics. 2. American Psychological Association. The largest scientific and professional organisation representing psychology in the United States, with more than 122,500 researchers, educators, clinicians, consultants and students as its members. You can peruse research on learning and psychology here. 3. EDUCAUSE Library. An international repository for information concerning the use and management of information technology in higher education, aggregating over 24,000 resources. 4. TED Talks. Some of the best talks on learning and psychology include come from Dan Pink, Angela Duckworth, and Carol Dweck. Bonus: National Geographic Learning is creating a new series of programs for English language learners featuring videos from TED Talks. The TED Talks, which feature 15-minute-long videos from distinguished speakers on a variety of topics, will be incorporated courses that feature additional National Geographic Materials. The program is aimed at adult English learners and focuses on people and places with a global bent. Check it out here. 6. Monash Research Repository. A collection of open-source publications on education and learning. Monash University has a particularly prolific and high-quality educational research output. 7. ScienceDaily. An excellent and constantly updated cache of the latest scientific research. Check out the following categories, which are updated daily: Educational Psychology, Intelligence, Creativity, Literacy, Educational Technology. 8. Science of Learning Research Centre (SLCR). A special research initiative of the Australian Research Council. Researchers in education, neuroscience, and cognitive psychology work together with teachers to understand the learning process. Research is divided into three categories: Understanding Learning, Measuring Learning, and Promoting Learning. 9. Harvard Family Research Project. Addresses issues of access and equity in learning, and advancing family and community engagement practices that reinforce success for all students. Research focuses on three components of learning and development: complementary learning, family involvement in education, and out-of-school time. 10. The Creativity Guru blog. Dr. Keith Sawyer explores the science of creativity, innovation, and learning. Sawyer is one of the world’s leading scientific experts on creativity. You don’t want to miss out on his insights. 11. Google Books. Even if you don’t want to buy the whole book, you can access sections of it through the preview function. A good research tool for students and teachers alike. The Google Books initiative has been hailed for its potential to offer unprecedented access to what may become the largest online body of human knowledge and promoting the democratisation of knowledge. As of April 2013, the number of scanned book titles was over 30 million. Google estimated in 2010 that there were about 130 million distinct titles in the world, and stated that it intended to scan all of them by the end of the decade. 12. Centre for Research on Learning and Teaching via UM. Founded in 1962 at the University of Michigan (U-M), the Center for Research on Learning and Teaching (CRLT) was the first teaching center in the country. You can browse through its research publications online. A great resource for educators seeking research on anything from teaching with technology to informal learning, to student motivation to learning styles. Some very interesting information to be found here. 13. Google Scholar. Google Scholar is a freely accessible web search engine that indexes the full text or metadata of scholarly literature across an array of publishing formats and disciplines. While Google does not publish the size of Google Scholar’s database, third-party researchers estimate it to contain roughly 160 million documents as of May 2014, and an earlier statistical estimate published in PLOS ONE estimates approximately 80-90% coverage of all articles published in English. 14. Teaching & Learning Lab via MIT. The Teaching and Learning Laboratory, which began in 1997, collaborates with members of the MIT community to promote educational excellence. TLL also plays an important role in MIT-wide innovations in pedagogy, curriculum, and educational technology that both strengthen the educational experience for students and impact national and international initiatives in STEM teaching and learning. You can search the TLL library for articles on a wide variety of educational topics. 15. Centre for Research on Teaching and Learning via NYU. The Center for Research on Teaching and Learning (CRTL) was organized in spring 2002 in the Steinhardt School of Culture, Education, and Human Development’s Department of Teaching and Learning. CRTL’s mission is to support the Department’s Teacher Education Programs in fulfilling their commitment to develop professional educators who have a broad and deep understanding of their practice, along with a moral commitment to equity and social justice. CRTL works with NYU faculty and staff to coordinate, design, and implement research and evaluation projects that will help to inform and improve our pre-service and in-service teacher development efforts. CRTL also serves as a forum for faculty and staff to share ideas and discuss the critical issues in urban education. In all research endeavors, CRTL focuses on the processes and causes that underlie the ultimate goal of the work of education and effective teaching resulting in high student achievement. 16. The Brilliant Blog by Annie Murphy Paul. Annie Murphy Paul is a book author, magazine journalist, consultant and speaker who helps people understand how we learn and how we can do it better. Her blog is full of the latest research and useful tips for applying it to an educational setting. 17. The Science and Education Blog by Daniel T. Willingham. A great resource for interesting topics in learning and education, brought to you by a tenured professor of psychology at the University of Virginia. 18. Psychology Today. Insights from over 750 renowned psychologists, academics, psychiatrists and authors. You can browse through various topics, including Memory, Intelligence, Neuroscience, Creativity, and Cognition. And it’s not just for psychologists. Many contributors are educators themselves, and many of the articles are written with practical applications in mind. 19. ScienceDirect. A leading full-text scientific database offering journal articles and book chapters from nearly 2,500 journals and 26,000 books. 20. Google Scholar. A freely accessible web search engine that indexes the full text or metadata of scholarly literature across an array of publishing formats and disciplines. While Google does not publish the size of Google Scholar’s database, third-party researchers estimates it to contain roughly 160 million documents as of May 2014 and an earlier statistical estimate published in PLOS ONE estimates approximately 80-90% coverage of all articles published in English. 22. Science and Education Publishing. Science and Education publishing (SciEP) is an ideal outlet researchers and a great source for educators. SciEP’s main goal is to increase the importance of science worldwide, to give all researchers equal opportunity to share ideas, develop their career, and for their work to have impact around the world. All the journals in SciEP are free from all access barriers, allowing for the widest possible global dissemination of research. 23. Time.com. Especially Annie Murphy Paul’s weekly column on learning. 25.Australian Association for Research in Education. AARE is the national association for fostering educational research in Australia. AARE facilitates contact between educational researchers and supports the development of high quality educational research. Their journal is the Australian Educational Researcher. Check out the EduResearch Matters blog as an added bonus. 26. Routledge Education Arena. In total, Routledge publishes over 250 journals in the field of education, covering subjects like Open & Distance Education and eLearning; Research Methods in Education; Study Skills; and Training & Leadership. Stay abreast of the latest trends and hot topics in Education with the Education Arena’s Newsroom. 27. Mind Matters via Scientific American. Founded in 1845, Scientific American is the oldest continuously published magazine in the U.S. The Mind Matters blog showcases the latest in peer-reviewed psychology and neuroscience, much of which is often applicable to learning and instruction. 29. Ascilite The Australasian Society for Computers in Learning in Tertiary Education is a globally recognised, professional association for those engaged in the educational use of technologies in tertiary education. It features a connected community of professionals and academics working in fields associated with enhancing learning and teaching through the pedagogical use of technologies. The Australasian Journal of Educational Technology (AJET) is ascilite’s refereed academic journal that aims to promote research and scholarship on the integration of technology in tertiary education, promote effective practice, and inform policy. The journal has its own website here where you can read current and past issues. 30. Wikipedia. Some of us still don’t accept Wikipedia as a reliable academic source, but maybe it’s time we did, if only because it’s a great example of the democratisation of knowledge. The collective knowledge of the human race is a precious resource, and sites like Wikipedia strive to preserve it rather than further their own agenda. A great lesson for students! 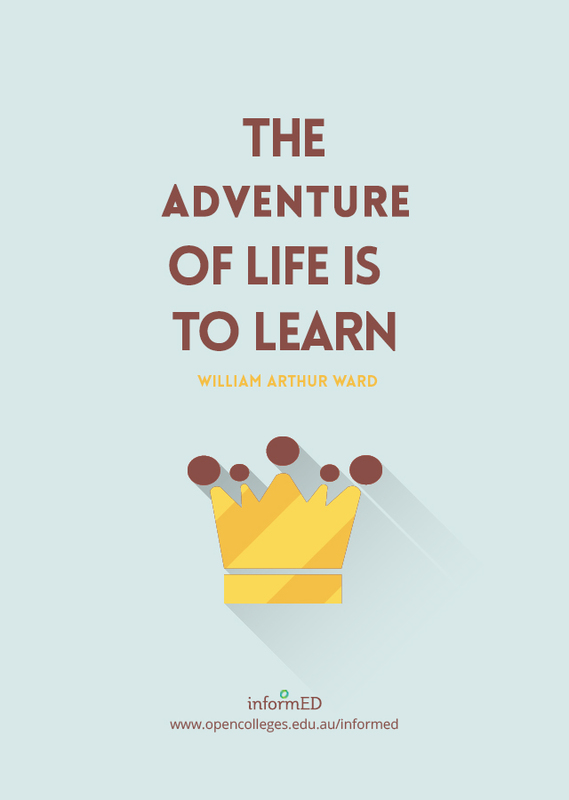 From the very beginning when I read the phrase ” the adventure of life is to learn ” then makes me smile because I agree that we should learn even in the small things. I really like reading your guidelines on learning. Education is very important. Dear Saga, thank you for all your regular posts. It’s very inspiring to read them. Thank you for reading, Adyananda!